There is just so much to see and shoot in London - one can never get it all done! But keep trying because it sure is fun! For example, here is a secret little spot that you might not find if it weren't for a little help. I got my help from two friends who live in London - Mike Murphy and John Esslinger. In addition to being great photographers, they are genuinely nice guys and excellent tour guides for photo spots and pubs :). We were doing the photowalk thing and had finished up shooting Big Ben at sunset (which was awesome, BTW), when they asked me if I was interested in a little graffiti. Um...heck ya! This is only about a 5 minute walk from the London Eye but is sorta tucked away. Without their help I would not have known about it. 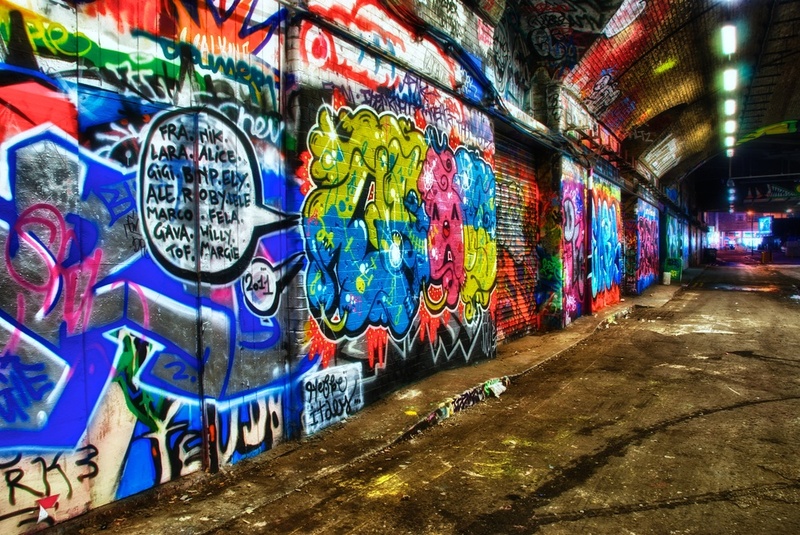 This entire tunnel is graffiti'd from one end to the other - a HDR heaven in London! I also compiled a list of what I consider the Top Photo Spots in London, which you can read here. Also check out Mike's and John's shots as they have plenty from this wonderful city by the Thames!